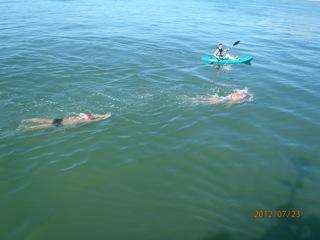 A four man multi-national Aquaholics team with an average of 64 swam their way into the history books of the English Channel on the 23rd July 2012 in a time of 15 hours 3 minutes. 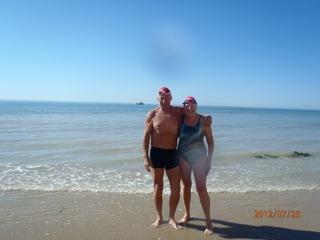 "Never again" were famous last words said by Roger Allsopp at the end of his world record 2011 solo swim becoming the Oldest Person to swim the English Channel. I believe he had also said the same phrase in 2006 at the end of his first solo crossing!! Sue Oldham said very similar words too at the end of her 2010 solo swim when she regained her world record as the oldest woman in the world to swim the English Channel. 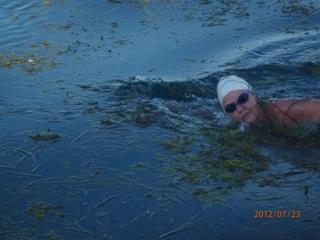 In 2011 the Barracudas Aquaholics team was formed with Sue Oldham, Tony Parbery, Kathy Phillips and Les Stewart. 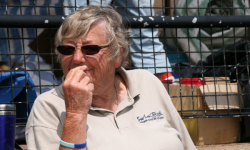 Unfortunately in 2012 Tony had to withdraw due to ill health and coach Pauline Pratt contacted Roger to see if he was interested in joining our depleted team, to our delight he was. 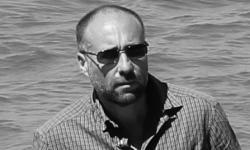 A couple of months later Les had heart problems and we were lucky to have Tom McCarthy from Ireland answer the call. Western Australians find it difficult to find really cold water to train in, and Kathy and I were no exception, but fortunately had spent several months cold water training, lucky for us that Roger and Tom were prepared to join our team despite such short notice. 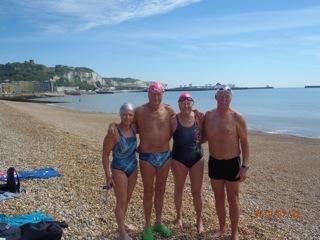 So began our four man multi-national Aquaholics team with an average of 64, (Roger at 71, Sue at 66, Kathy 60 and Tom 59) swimming our way into the history books of the English Channel on the 23rd July 2012 in a time of 15 hours 3 minutes. We met the skipper of Anastasia, Eddie Spelling, and his crew down at Dover Harbour and made our way around to Samphire Hoe early on 22nd July. 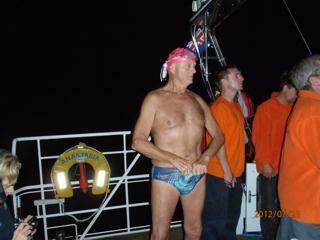 It was a dark, cold, early morning start and initially the ocean was very cold and so were the swimmers! During a couple of legs of the swim there were clumps of weed in the water which made swimming unpleasant but eventually that cleared and after several more one hour legs a beautiful sunrise greeted us, eventually even some heat in the day and finally the French coast coming into sight. 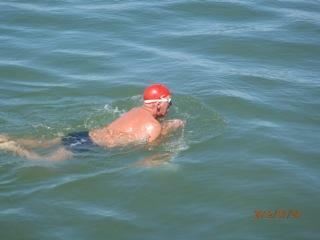 The mild breeze increased to brisk as we neared the coast of France ensuring we would all have to swim at least an extra leg each, but then this is the English Channel and you just never know what, or how often, the conditions will change. And change they did to our relief, and ultimately we had lovely conditions and a nice sunny day. All that hard work and preparation had been worthwhile and we were excited and delighted with our successful crossing of the English Channel. The Aquaholics team would like to acknowledge the support and skill of our skipper Eddie Spelling and his crew, our special thanks to our observers, to our coach Pauline Pratt and to Tony Parbery who despite his disappointment not being able to swim was a wonderful support to us all and in his 'spare' time our photographer. Les Stewart wasnt able to join us on the day but was with us in spirit and there waiting to greet us when we returned to Dover Harbour.